The night before prepare the poolish, by mixing all ingredients and letting them rest in a bowl, covered. I usually leave it in the fridge covered with plastic film. In a large bowl, mix hard wheat flour, milk, eggs, sugar and salt until thoroughly combined. Add poolish and butter, and continue mixing. When the dough sticks together and is consistent, turn it onto a lightly floured surface and knead until smooth and elastic, about 10 minutes. If you are not familiar with kneading, click here to watch a video by Bertinet showing how to knead sweet dough. Shape into a ball, and let the dough rest in the same bowl you’ve used before until it has doubled its size, it will take about 1 hour. Divide dough into equal pieces. You will need six pieces for each flower: 1 for the base and 5 for the petals. Shape into smooth balls, and place on a baking sheet, forming a flower. Let it rise for 30 minutes. 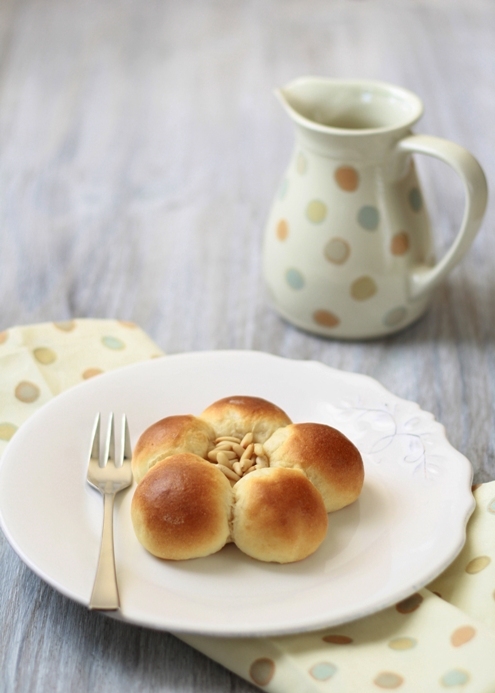 Brush buns with milk, then pour some custard and dampened pine nuts into the center of the flower. Put buns in oven. Lower temperature to 180° C (356° F). Remove from oven and let them cool on a wire cooling rack.